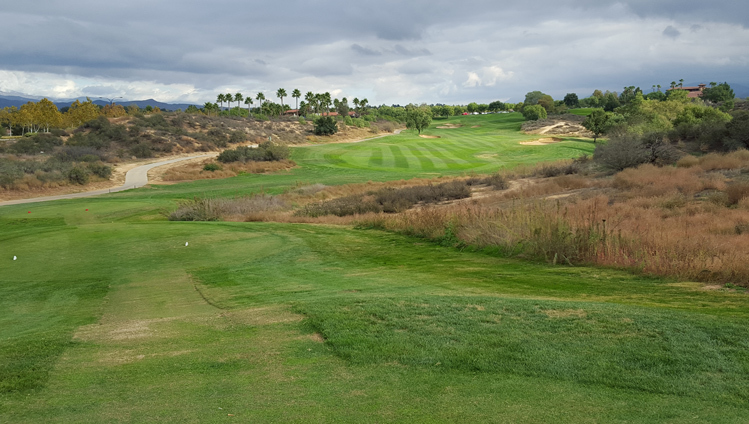 Morongo Golf, Champions Course Hole 3: This short par four is a dogleg left and the drive can just be a mid iron to leave a wedge to the green. However, one also can try to cut the dogleg and go for the green off the tee. However, there are lots of bunkers surrounding the green, which is deep and narrow, so it is a risk/reward hole for sure. Morongo Golf, Champions Course Hole 4: The best hole on the front nine, called “Split Decision” gets its name from the great driving choice the player must make on the tee. There is a creek hazard that runs through the middle of the fairway. However, there is a ribbon of fairway to the left of it that, if the player can negotiate, opens up a shorter, direct route to hitting over the cross-bunkers to the green in two. The safer play off the tee makes it a three shot hole with a tough second shot that must cross the creek to a small fairway area dotted with bunkers. Morongo Golf, Champions Course Hole 6: This par four is straight uphill and presents the first real tough hole on the front nine. The angle to the green is much better from the left side, but only if not from the bunker or the deep rough on that side of the landing area. Morongo Golf, Champions Course Hole 7 (left): This uphill par four is a dogleg right with a tough line to pick off the tee. The best line is actually just inside the tree line to the right side. The approach is uphill again with a big bunker short and left that must be avoided. Morongo Golf, Champions Course Hole 11: This par five has a tough drive that has to stay right (or short) of the bunker to the left, which is very penal. The creek however, that starts down the right side is in play and pinches in with long drives. From there, it is uphill to the green all the way, which is well-guarded by sand traps. Morongo Golf, Champions Course Hole 12: This par far starts from a plateau with plenty of driving room short of the fairway bunkers on either side of the fairway. However, the player that can fly the bunkers on the right will find his shot bounding down a steep hill towards the green, leaving a short pitch. Of course, there is a hazard all the way down the right side that will swallow and errant shot. Either way, the approach is way down hill to a green fronted by a deep bunker that must be avoided. 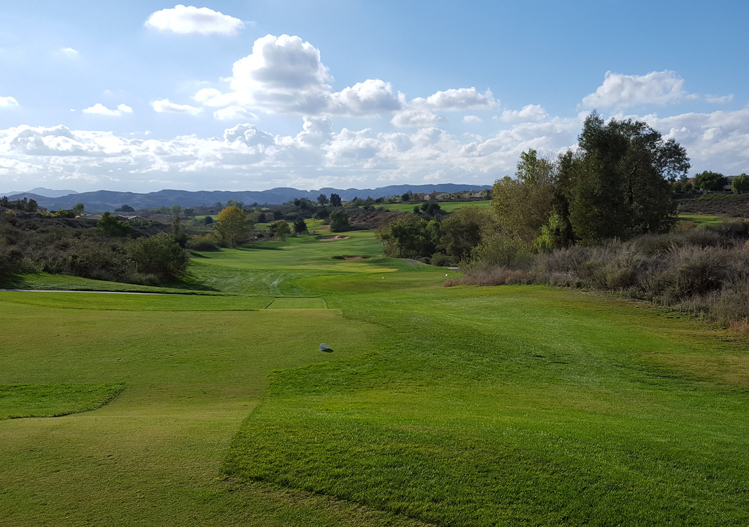 Morongo Golf, Champions Course Hole 13: This quirky par 4 requires just a mid to long iron off the tee to lay up short of the creek that cuts diagonally across the hole (the adventurous player can attempt to clear the creek, but it is a tight landing area). The farther the player lays up from the creek, the longer the approach will be to a tight, well guarded, and difficult to putt green. Morongo Golf, Champions Course Hole 14: This is a long downhill par four with a tough drive with trouble on both sides. The approach is to a large green with a big bunker on its left side. 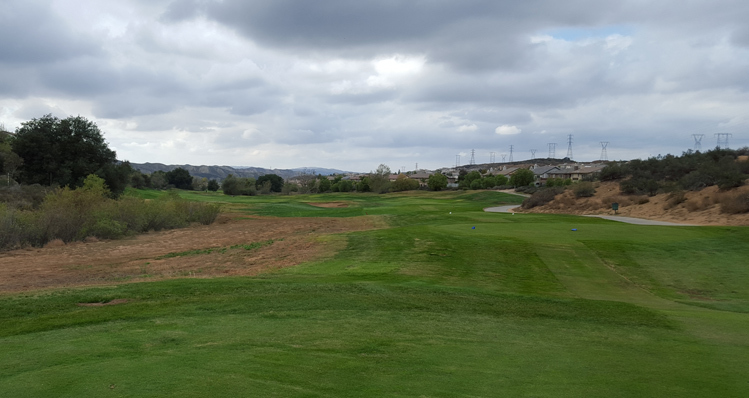 Read More California Golf Course Reviews.